The final death toll of the weekend’s flooding on the Riviera is still not known. Two people are still missing on Tuesday. Meanwhile, schools, public transport and electricity supply have all been affected with a clean-up underway and insurance claims being looked at. 20 people are known to have died as a direct result of the disastrous weather. Two people are officially missing since Monday evening in the Cannes area while two others who had been missing were found safe and sound in Villeneuve-Loubet in the Alpes-Maritimes. According to Nice Matin, they were two German nationals who had been staying at a campsite. The same newspaper said that the autopsy carried out on the body of a homeless man found in a park in Nice on Sunday confirmed that he died as a result of the flooding. He apparently perished while desperately trying to get to shelter but was trapped by brambles. Several schools in the area will still closed on Tuesday and aren’t expected to reopen for several days – particularly in Cannes, Valbonne, Biot and Vallauris. Several train services have been curtailed (only one TGV currently running between Paris and Nice) or cancelled altogether (such as the Grasse-Cannes line). The SNCF estimate that normal services won’t be fully restored until “Saturday or Sunday at the earliest”. Some roads are still closed too, including the RD23 and the RD35. 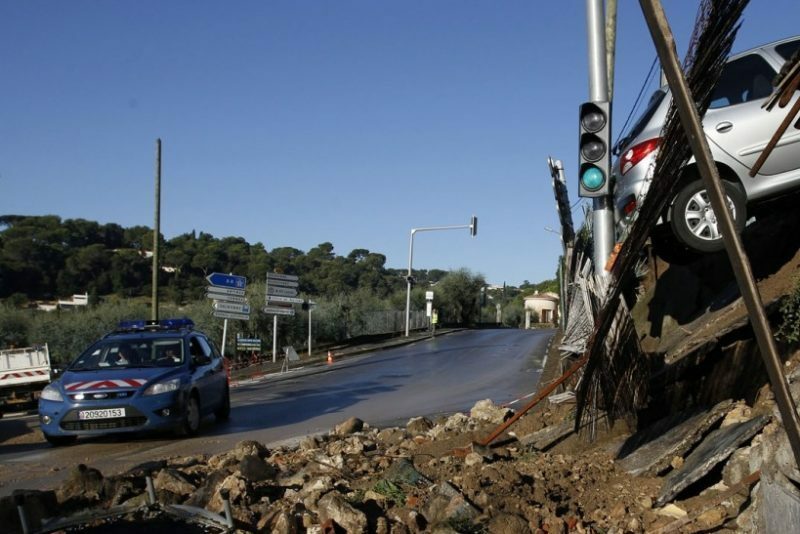 At the height of the crisis on Saturday night, an estimated 70,000 homes were without power and there are still more than 1,800 homes without electricity in the area – 1,200 in Mandelieu, 570 in Cannes and 66 in Antibes. In the French parliament today, meanwhile, deputies observed a minute’s silence to remember the victims of the tragedy.